Mass Fidelity launched a new crowdfunding campaign on Indiegogo to fund the production of the raD, a portable, rugged Bluetooth speaker aimed at those who wish to listen to music both indoors and outside – even in bathrooms, kitchens, at the swimming pool and on the beach. Mass Fidelity reached a wide audience two years ago thanks to their Core wireless speaker, also the subject of a crowdfunding campaign. The speaker garnered appraisal from critics and public alike thanks to its sound quality and connectivity options. The name “raD” itself comes from the “radial Dispersion” technoolgy it is based on, which allows to diffuse sound all around the speaker so that the listener’s position does not affect the listening experience too much – which is ideal for bathrooms, kitchens and open environments. The Mass Fidelity raD appears to be a slimmed-down and rugged version of the Core: it maintains compatibility with Core networks and can be connected to up to eight other raDs and Cores (including the subwoofer unit) for multi-room playback. 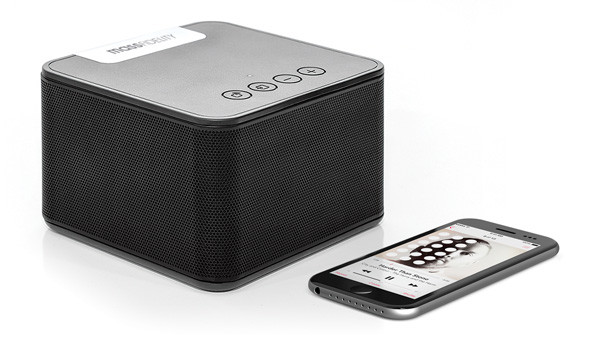 It uses both Bluetooth 4.1 (supporting aptX and AAC) to connect to smartphones/tablets/PCs and its own proprietary 5GHz network to connect to the other speakers. Among the most prominent features we find IPX5 water resistance rating, a battery capable of offering up to 8 hours of playback, NFC, a relatively small size (12 x 12 x 7 cm) and an array of five speakers (four 1.5-inches drivers and a 3-inches woofer). The device also offers 3.5 mm jack input and a USB connector. The Mass Fidelity raD will presumably ship before the end of April 2017; the campaign has already reached its funding goal. The speaker can be bought on the campaign’s page for 169$ (plus shipping for orders outside of USA and Canada) with the current offer limited to 250 devices; price will be 189$ until the end of the campaign. There are also perks with two or more speakers for those wishing to have more than one.